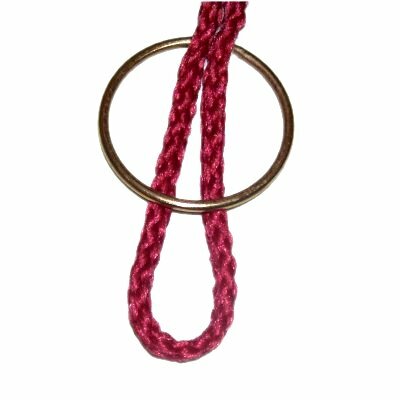 The Royal Hanger features long Spiral sennits, along with a unique Macrame design at the top. The Square knot designs in that area curve outward, which is called a Royal Crown. 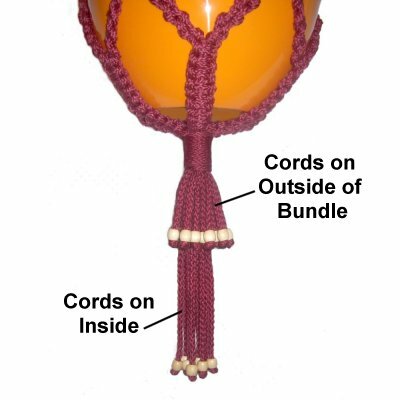 The cradle is made with two types of decorative knots. The custom design allows you to use any size plant pot or bowl, but you will have best results if the pot is at least 10 inches wide. This Macrame project is rated Easy to Moderate, suitable for beginners. 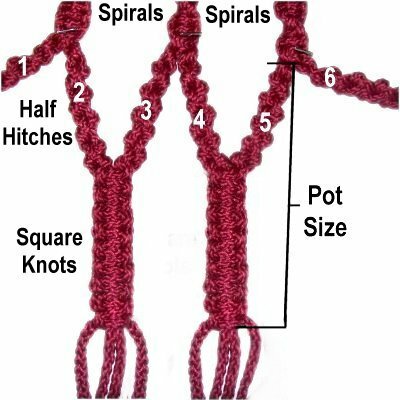 Make sure you are able to tie all the knots used in the design, listed below. The finished size for this plant hanger is 45 inches, which includes a double length beaded fringe at the bottom. Cut 12 cords, each 8 yards long. Prepare the tips with tape, compressing the material so the area is as narrow as possible. Cut 1 cord, 2.5 yards long. Cut 3 cords, each 40 inches long. 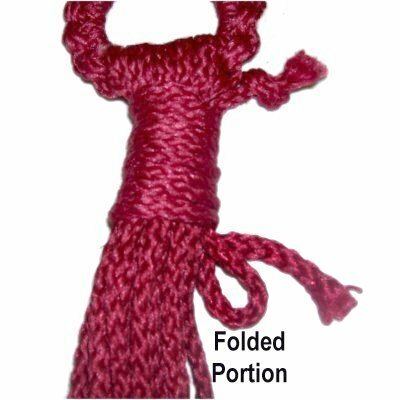 << Fold the 2.5-yard cord in half, and place the folded area under the ring, and the rest through it. Step 2: Now you will cover the ring at the top of the Royal Hanger, using each half of the cord. << Pass the right half of the cord over - under the ring, and over the cord, counter-clockwise. 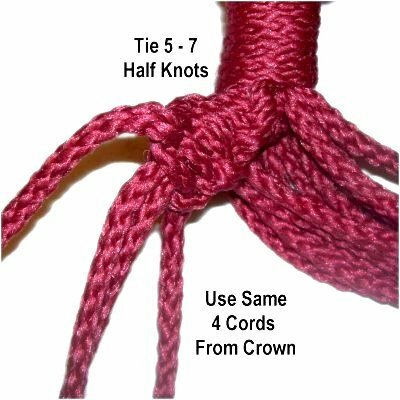 Tie several more Larks Head knots with the right half of the cord, covering 1/2 of the ring. Push the knots close together as you progress. 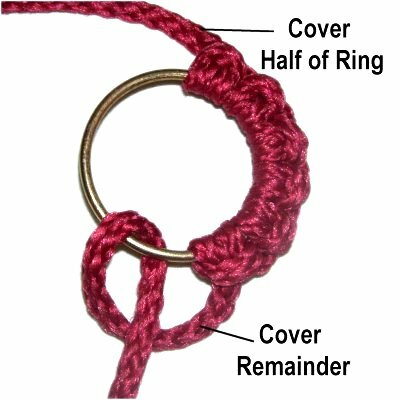 Then use the left half of the cord to cover the remainder of the ring. The only change is that the loops are made rotating clockwise. Make sure there are no gaps between the knots. Add more knots if needed. 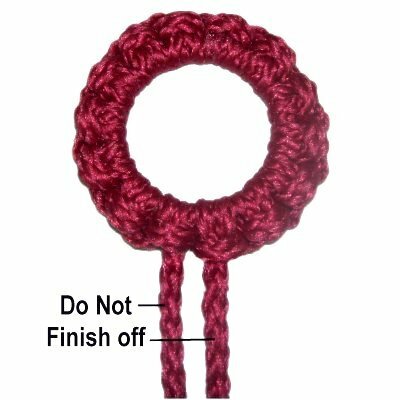 Important: Do not finish off the two ends of the cord, just let them dangle freely. I will now refer to it as the "ring cord" in the following instructions. Pass 6 of the 8-yard cords through the ring, positioned in the areas marked with an (X). Some will rest on top of the ring cord. Match the ends and adjust each cord separately, until it's balanced. Then place the remaining 6 cords on top of the others, and balance them, too. 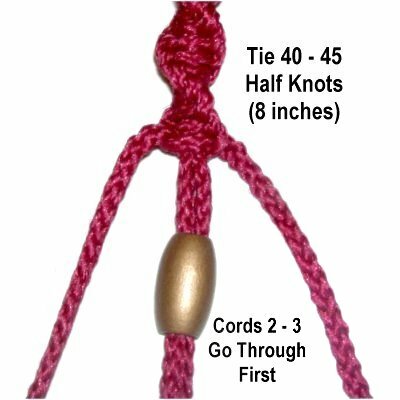 Tie an Overhand knot at one end of a 40-inch cord. Secure it to the right of the cords on the ring. Move the cord down 3 inches and secure it. Then bring it back up to the ring. The longest portion of the cord is considered the working end. Wrap the working end around the group of long cords, passing over the secured portion, too. You'll be moving right to left in front, and left to right in back. Continue to wrap firmly and evenly, making sure the coils don't overlap. You have enough material to wrap for approximately 1.5 inches. 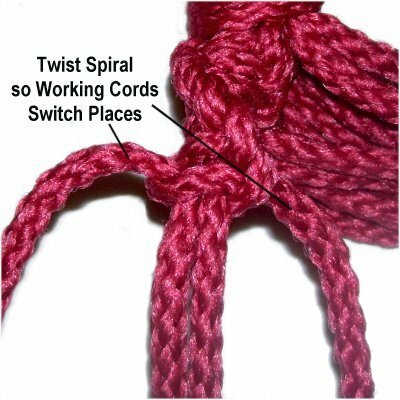 The folded area of the cord now looks like a small loop. Pass the working end through it, back to front (towards you). 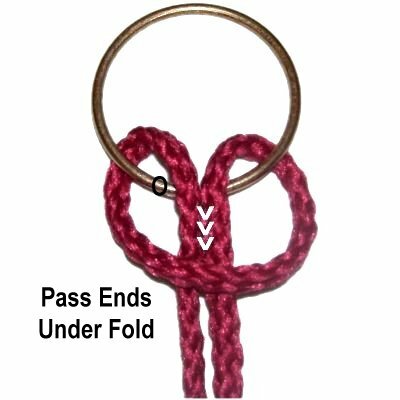 Pull the secured end (with the Overhand knot). The working end and loop will move inside the wrapped portion. Try to pull it half way through if you can. Cut off the excess and tuck the stubs inside the Wrapped Knot. Make sure you don't cut the long cords! Step 4: Organize the 8-yard cords into 6 groups containing 4 cords. It helps if you can secure the cords on a Project Board, with the Wrapped Knot upright, as shown in the images below. Your other option is to create the rest of the Royal Hanger while it's suspended from a hook in a wall or ceiling. Next you will make the Crown at the top of the Royal Hanger. 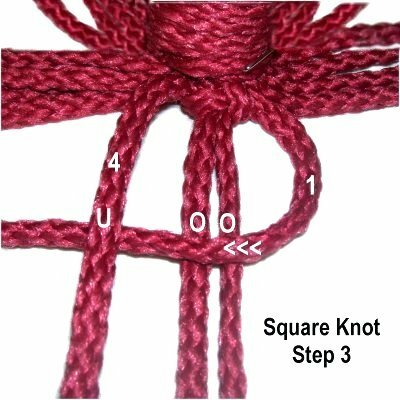 Step 5: Using one group of four cords, tie the first Square Knot as described below. Start by mentally numbering the cords 1 - 4. << Curve cord 1 to the right, passing over cords 2 - 3 and under cord 4. 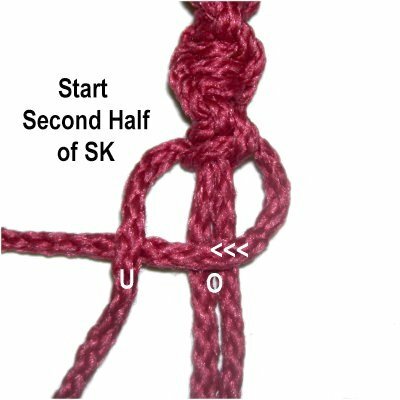 Pull both ends firmly to tighten the first half of the SK. << Curve cord 1 to the left, over cords 2 -3 and under cord 4. Move cord 4 to the right, under cords 2 - 3 and over cord 1. Tighten firmly. Make sure the SK rests against the Wrapped knot. 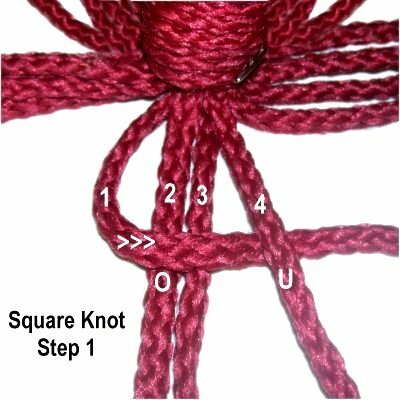 Step 6: Repeat step 5, tying a total of 20 knots (includes the first one already tied). Bundle up the four cords so they are separate from the others. Important: Make sure the knots are close together with no gaps between them, or the Royal Hanger will be lopsided. Step 7: Repeat step 6 with the other five groups. Bundle each group of cords separately, after you finish. Important: Measure to make sure all the sennits are the same length. Push the knots closer together as needed. Step 8: Organize the sennits and make a bundle with all the cords. 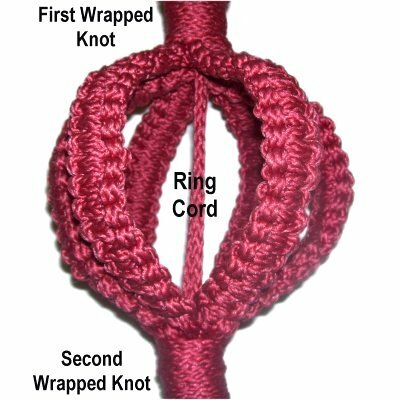 Make sure nothing is twisted and the two ends of the ring cord are in the center of the bundle. Repeat step 3, tying a second Wrapped Knot around all the cords. Important: Make sure you wrap as tightly as you can. Step 9: Hold both ends of the ring cord firmly while you slide the Wrapped knot upward. The SK sennits will bulge, forming the crown for the Royal Hanger. 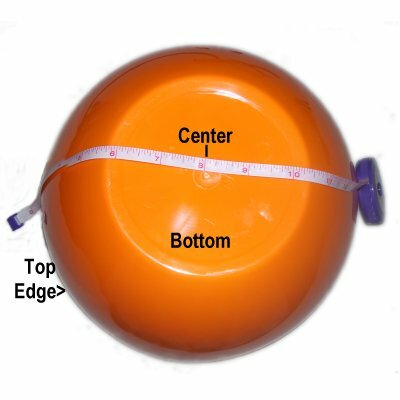 Measure from the bottom of the first Wrapped Knot to the top of the second one. They should be 4 - 5 inches apart. Make adjustments to the placement as needed. Step 9, continued: Pull on all the long cords firmly, below the second Wrapped Knot. 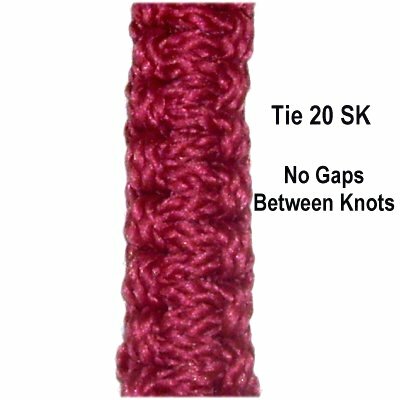 There should be no gaps between the SK and the Wrapped Knot. Make sure the sennits are all curved the same and are evenly spaced. 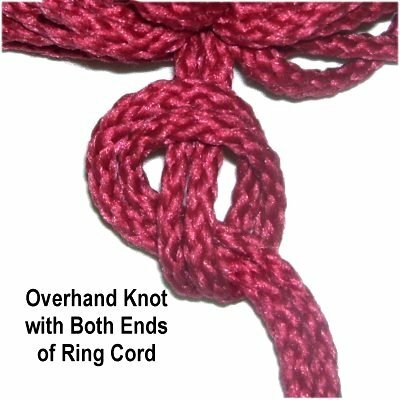 Step 10: Using both ends of the ring cord, tie an Overhand knot. 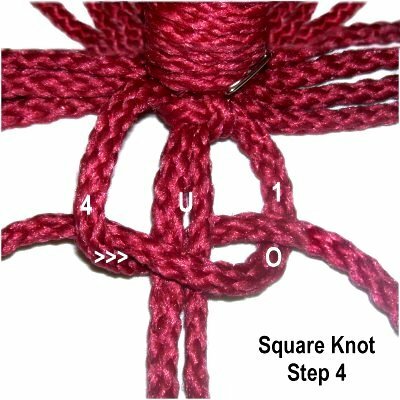 Make sure you tighten the knot so it rests against the bottom of the second Wrapped Knot. Apply glue if you wish, then cut off the excess material. When using nylon or Bonnie Braid, apply a flame to the stub to melt the material. 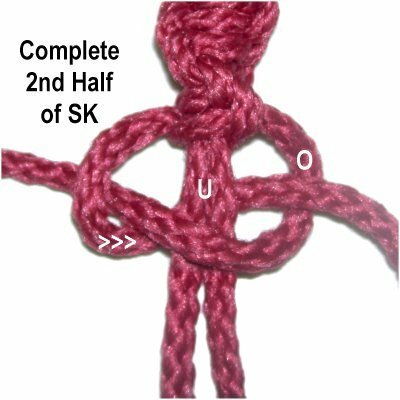 The long sennits for the Royal Hanger are made with the Spiral Stitch, which is a series of Half Knots (1/2 of SK), as described below. Important: You need to use the same groups as you did for the crown, which is why you bundled them separately. Use the same working cords and fillers, too. The working cords are shorter than the fillers. Step 11: Mentally number the four cords in one group. << Move cord 1 to the right, passing over cords 2 - 3 and under cord 4. 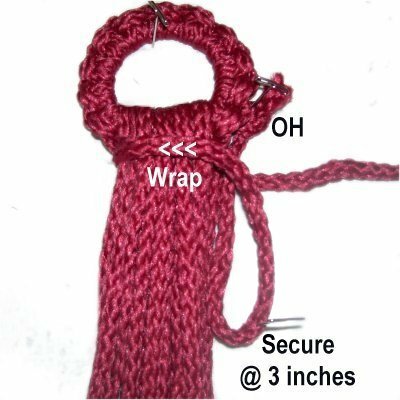 Pull both ends firmly to tighten the Half Knot. 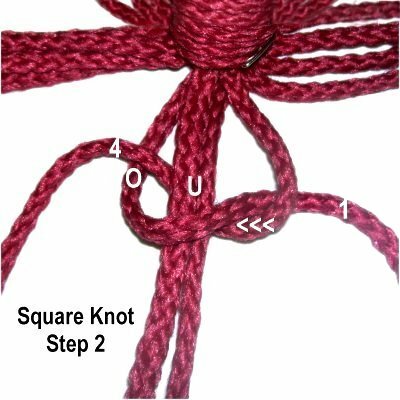 The knots will begin to spiral on their own, but if you tie a total of 5 - 7 knots, then twist the sennit so the working cords switch places, the sennit will be more attractive and evenly spaced. Step 12: Repeat step 11, tying a total of 40 - 45 Half Knots, until the Spiral sennit is 8 inches long. Slide a bead onto cords 2 - 3. Slide cords 1 and 4 (working cords) through the bead, positioned in front of cords 2 and 3 (fillers). This is important, since you will be switching cords to make the next section of the Royal Hanger. Step 13: Cords 2 and 3 are the longest of the group, so they now become the new working cords. Cords 1 and 4 are the new fillers. 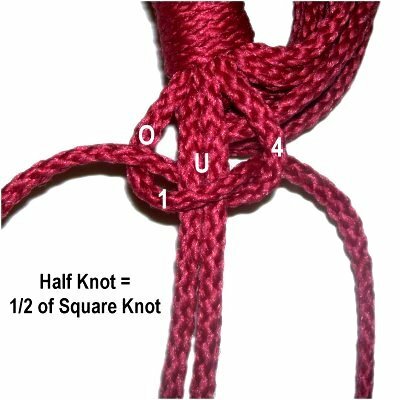 Tie the same number of Half Knots you did in Step 11. Do not add another bead. << Curve the right working cord to the left, over the fillers and under the left working cord. Move the left working cord to the right, under the fillers and over the other working cord. Step 15: Repeat steps 11 - 14 with the other five groups of bundled cords. Make sure you use the same working cords for the top portion of the Spiral (shorter than the fillers). Then add the bead and switch cords so you use the longest ones for the lower portion of the Spiral. The Cradle for the Royal Hanger is made specifically for the size pot you plan to put inside it. So you must measure the pot before you get started. Step 16: Measure the pot or bowl starting from the top edge, along the side, all the way to the bottom. Stop in the center of the bottom area. The result is the cradle length. Step 17: Mentally number the 4 cords for one Spiral Sennit. 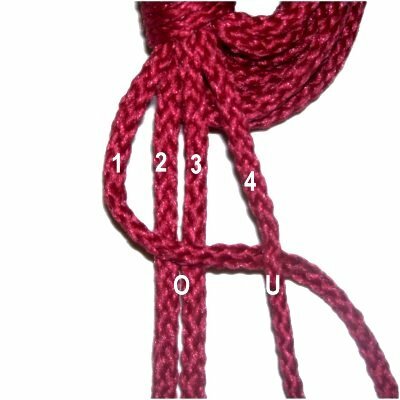 Important: Pass cord 3 under cord 4, so the longest cord (4) will be in the correct position for step 22. 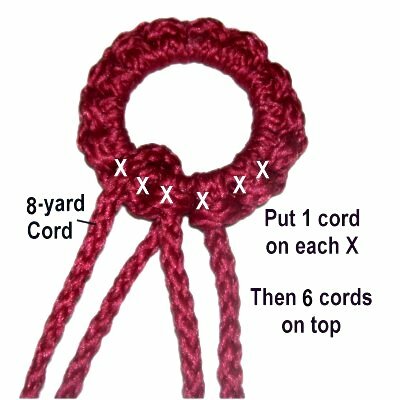 Step 18: Make a clockwise Half Hitch with cord 3 onto cord 4. 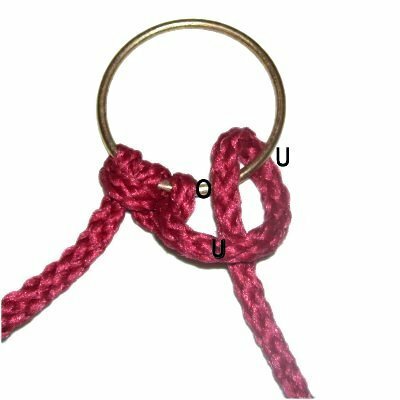 Step 19: Use cord 4 to tie a counter-clockwise Half Hitch onto cord 3. Step 20: Repeat steps 18 and 19 several times, alternating between cords 3 and 4. Stop when the sennit is 1/2 the cradle length. Step 20: Next you will use the other two cords from the same Spiral sennit. Pass cord 2 under cord 1. 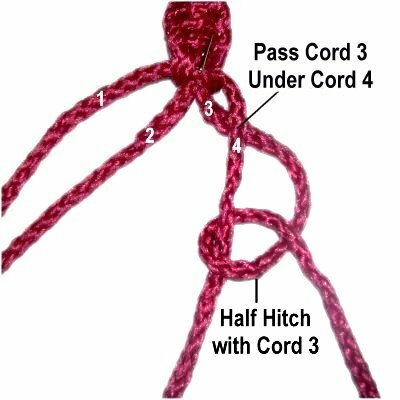 Tie a counter-clockwise Half Hitch with cord 2 onto cord 1. 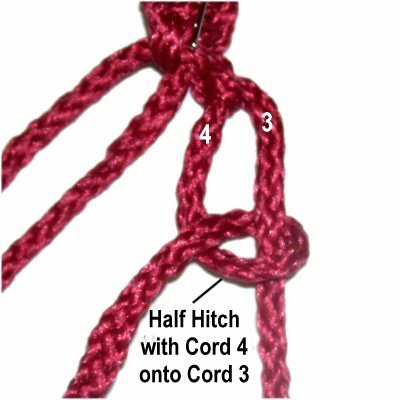 Then you switch and use cord 1 to tie a clockwise Half Hitch onto cord 2. Make it the same length as the other sennit. Step 21: Repeat steps 17 - 20 using the cords from the remaining five Spiral sennits. Place three Spirals on your board. 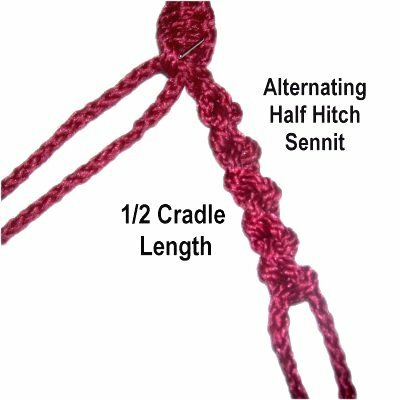 Mentally number the six Half Hitch sennits. Step 22: Combine the cords from sennits 2 and 3, tying a series of Square knots. Push them close together. Stop when you have reached the appropriate cradle length (pot size). Do the same with sennits 4 and 5. Step 23: Repeat step 22 with the cords from the other three Spirals. 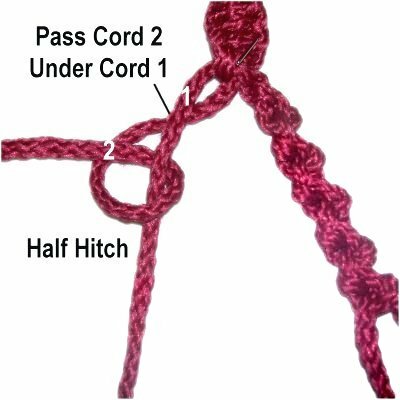 Then combine the remaining cords from Half Hitch sennits 1 and 6 (both groups), and repeat the same process. This is easier to accomplish with the hanger suspended. Make sure nothing is twisted and the cords are all combined properly. Gather all the cords together, holding them near the last SK tied. Place the pot in the Royal Hanger to see if the cradle is the appropriate size. The bowl or pot should be touching the cradle at the bottom where the cords are gathered together. Make adjustments as needed by adding/removing Square knots, or by pushing them closer together. Step 24: Tie a Wrapped Knot around all the cords. Pull each cord downward to eliminate any slack. 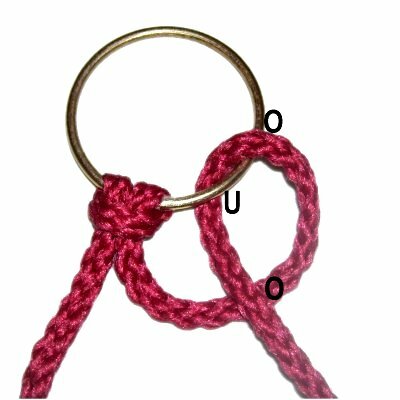 The Wrapped Knot should be touching the SK. Step 25: The final step for the Royal Hanger is to make a fringe with the ends of all the cords. My favorite technique is a double length beaded fringe shown below. 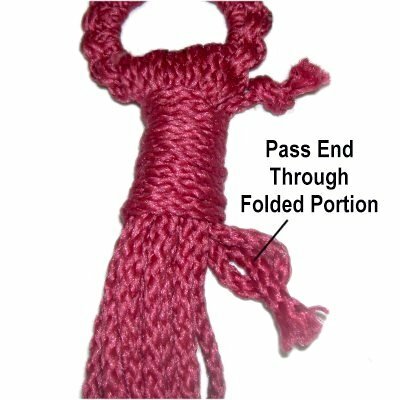 You can also unravel and brush the fibers, or just add finishing knots. When using Bonnie Braid or nylon, you can simply melt the tips with a flame. Test the material before you attempt this. Separate the cords into two groups, those on the outside of the bundle, and those on the inside. Create the longest fringe first, applying beads to the group from the inside. 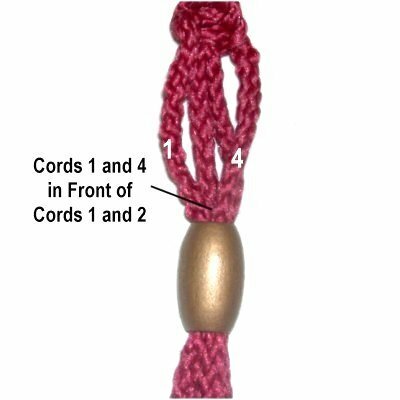 The beads should rest at least 10 inches below the Wrapped knot. 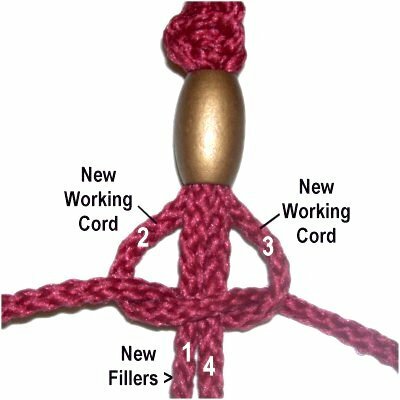 Tie an Overhand knot below each bead. Create the short fringe in the same manner, applying beads at least 5 inches below the Wrapped Knot. After all the beads are in position, compare them to each other to make sure they are at the same level. Make adjustments as needed. Cut off the excess material close to the knot. 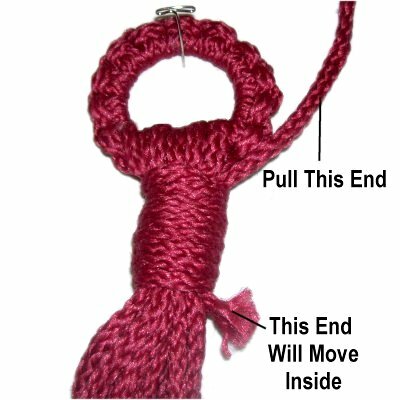 When using Bonnie Braid or similar material, melt the stub and press it against a surface so it rests flat against the knot. Have any comments about the Royal Hanger? Contact Me.